-- How parents and teachers can make a critical difference by making children good learners from the day they are born. 392 pages. 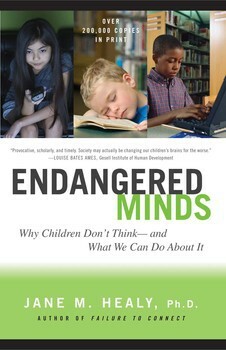 Is today's fast-paced media culture creating a toxic environment for our children's brains? In this landmark, bestselling assessment tracing the roots of America's escalating crisis in education, Jane M. Healy, Ph.D., examines how television, video games, and other components of popular culture compromise our children's ability to concentrate and to absorb and analyze information. Drawing on neuropsychological research and an analysis of current educational practices, Healy presents in clear, understandable language: -- How growing brains are physically shaped by experience -- Why television programs -- even supposedly educational shows like Sesame Street -- develop "habits of mind" that place children at a disadvantage in school -- Why increasing numbers of children are diagnosed with attention deficit disorder -- How parents and teachers can make a critical difference by making children good learners from the day they are born. 392 pages.